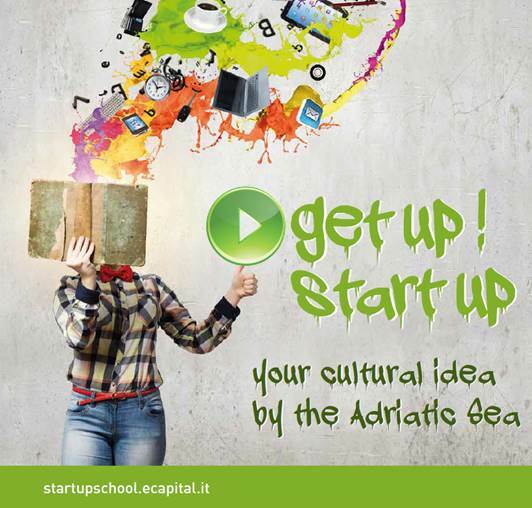 We are pleased to annouce you that within the new edition of the Adriatic Start-up School 2019 the call for ideas is now open! This Adriatic–Ionian Macro Region project is a unique experience in Europe promoted by Ecapital Culture in collaboration with AI-NURECC initiative. The main purpose of the project is the economic development of cultural tourism in that Area, throughout the creativity and resourcefulness of young people who want to set up a business . Ecapital Culture is a training path oriented to the development of innovative start-up working in the cultural tourism field and aimed to enhance the cultural heritage of the Adriatic-Ionian Macro Region. The primary objective of the project is to create the conditions so that the young people, especially from the countries of the Adriatic-Ionian Macro-Region, making use of their skills and their creativity, can achieve their own business idea. The project represents a real opportunity to develop the economy of this area and to increase professional employment with start-up creation. Attendance of the training course from the 6th of May 2019 to the 28th of June 2019, at the Start Up School in Ancona. room and board (both in a shared structure) for 8 weeks. Travel expenses are excluded and will be at charge of the participants. Scholarships are covered by the Promoters and Sponsors, in particular 4 scholarship to non EU students will be guaranteed by AI-NURECC European project. Therefore, the participation will be completely free for those admitted. The call for ideas is addressed to 20 young people, especially from the 8 countries of the Adriatic-Ionian Macro Region (including Adriatic Regions in Italy and excluding people coming from the Marche region in Italy, who will be object of a dedicated Call). – presentation of a business idea for the constitution of a start-up, aimed at enhancing the cultural heritage of the Adriatic-Ionian Macro Region. (TOPICS: archeological sites; architecture; events; food; live performance and theatre; movies; museum; music; publishing; theme parks; visual arts). It will be an additional evaluation element the possible presentation, not mandatory, of a reference letter (“comfort letter”) by public or private entity, that shows the knowledge of the candidate, of his business idea and its appreciation. It is possible to apply exclusively online on the website www.startupschool.ecapital.it , filling in the application form, starting from the 15th of January 2019 (opening date of the Call), within 12:00 am of the 17th of March 2019. The requests for participation that will be not completed with all the information required in the online application form, or that will be submitted after the deadline, will be automatically excluded from the selection. The selected candidates will attend a 8-weeks training course (from 6th of May to 28th of June 2019), aimed at developing the skills for the realization of a Business Plan in the cultural field and the creation of a start-up for the enhancement of the cultural heritage of the Adriatic-Ionian Macro Region area. The training course includes lectures, workshops, case histories and studios on the following areas: development and implementation of the business plan, enhancement techniques for a startup project, cultural planning and launching a startup. Tutors will be available to participants on a daily basis to support the development of their business idea, search for data and information and the planning process. For all participants assistance in identifying potential financial partners for the realization of the business projects is also provided. For detailed information on how to apply check the website www.startupschool.ecapital.it and read carefully the presentation brochure attached.